Brand new handbuilt Haar guitar from the Netherlands. Light weight, fantastic sound! 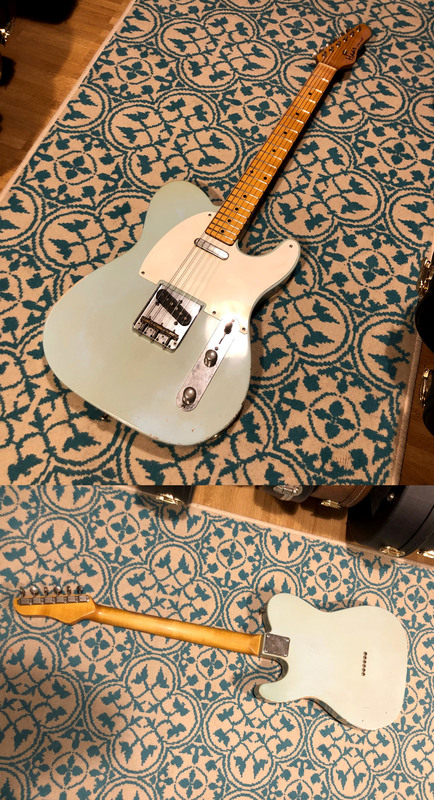 Sonic Blue, light aged, swamp ash body, quartersawn maple neck, C-shaped neck prpfile, bone nut, Jescar 55090 frets, 8-10" compound fretboard radius, Gotoh SD-91 tuners, Gotoh three-saddle bridge, Amber Twangtone 50 pickups. Custom-made by renowned Dutch luthier Eric van der Haar. Haar guitars are not assembled from Allparts or Warmoth parts, they are completely handbuilt from bare slabs of the best tonewoods! 50s-style models typically feature ash bodies and maple necks, 60s-style models feature alder bodies and rosewood necks. Haar guitars feature only the best boutique pickps, such as Andreas Kloppmann, Peter Florance, Jason Lollar, Lindy Fralin or Suhr, and only the best hardware, such as Wilkinson bridges, CTS pots etc! + + + Comes with Haar soft case.